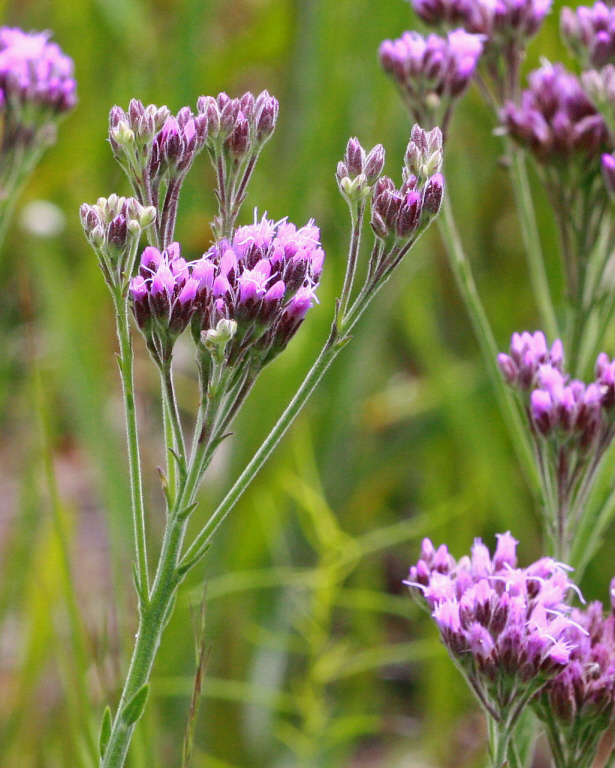 Pineland chaffhead is a short-lived perennial wildflower that occurs naturally in wet pine flatwoods, savannas and seepage slopes. It typically blooms in late summer through early fall and attracts butterflies, moths and other pollinators. It is endemic to only 13 Central and South Florida counties. The plant’s many purple rayless flowers are borne in broad terminal corymbs. Each flower is held by several hairy, spine-tipped bracts. The flower stalk emerges from a basal rosette of narrow, pointed leaves with entire margins. Stem leaves are significantly reduced. Stems are finely pubescent. Fruits are whitish pubescent achenes. Some botanists have separated most species of the genus Carphephorus into the genera Litrisa and Trilisa. Both genera names are anagrams of the genus Liatris, whose flowers have a similar appearance to Carphephorus flowers. Pineland chaffhead is the only species in the genus Litrisa. To see where natural populations of Pineland chaffhead have been vouchered, visit florida.plantatlas.usf.edu. Garden tips: Pineland chaffhead is drought tolerant in winter and spring, but needs plenty of water to survive the hot summer months. Pineland chaffhead plants are occasionally available from nurseries that specialize in Florida native plants. Visit www.plantrealflorida.org to find a nursery in your area.